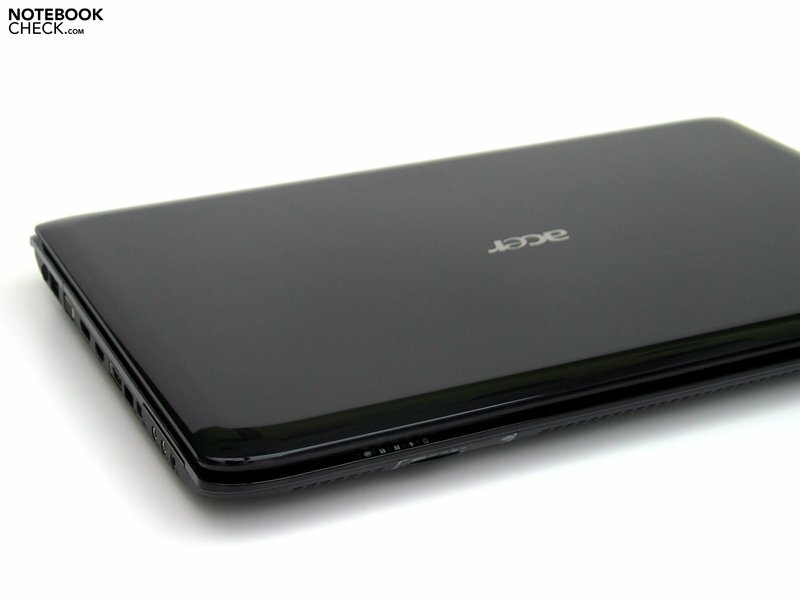 With the 8935G Acer presents an excitingly equipped multimedia notebook in the 18"inch format. For the price of 1500 euro there's a lot to be found. 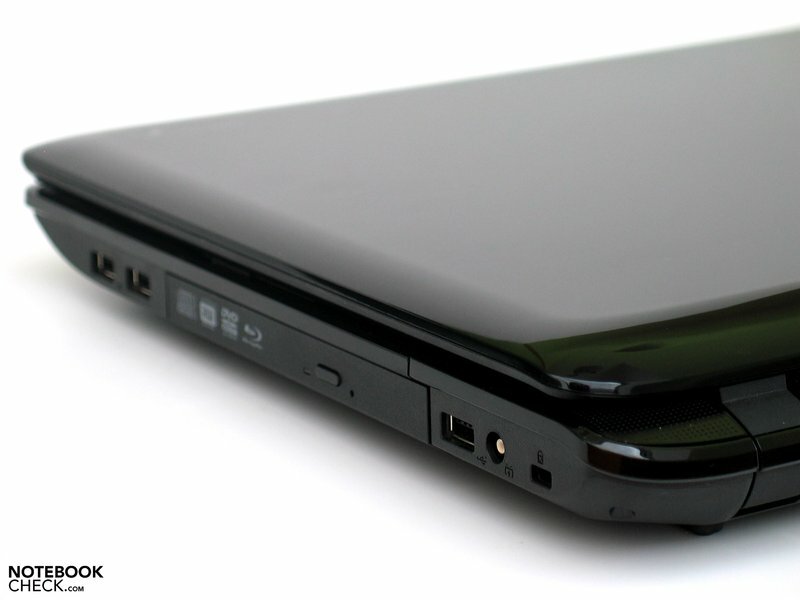 Beside the Q9000 Quad-Core CPU by Intel, as well as an ATI Mobility Radeon HD4670 as core components, there is a Blu-Ray Disc Drive and a 1080p FullHD Display. These Components seem to give the laptop a rather wide range of possible uses. 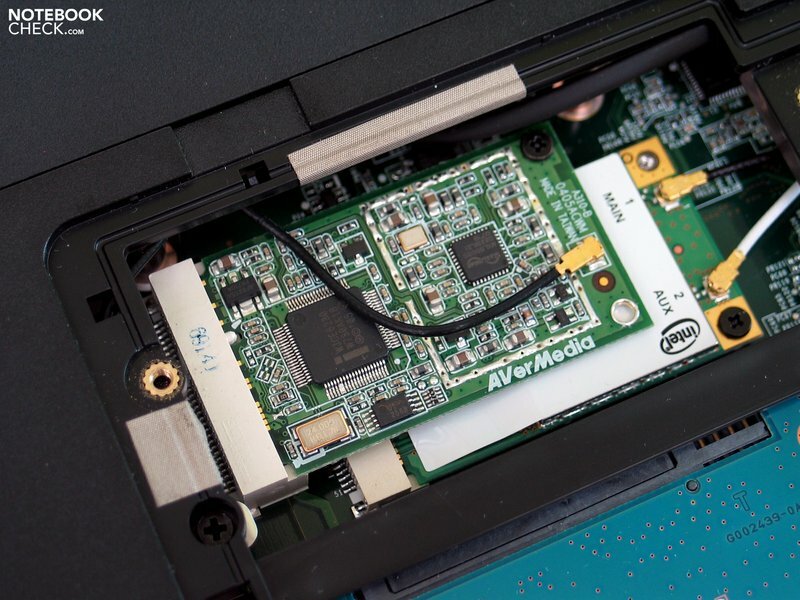 Read now, how the multimedia laptop proves itself in use. 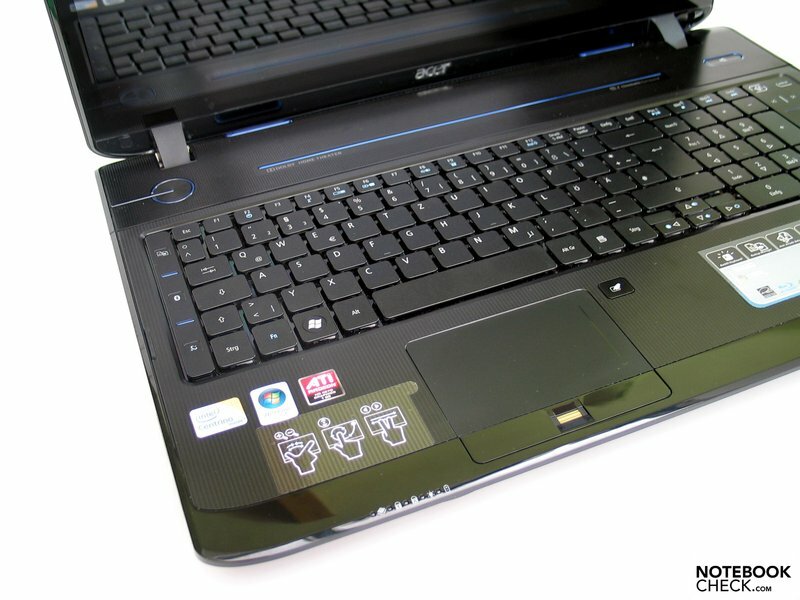 Right now there are a couple of different versions of the Acer Aspire 8935G for sale. The price ranges from just about 1000 euro up to round about 1700 euro, depending on the equipment. The versions available in the German-speaking area have differing hard drives (1x320GB up to 2x500GB), as well as differing optical drives (DVD-RW or Blu-Ray) and different processors available. Here the entrance option is a Core Duo T6500 CPU by Intel (2.1 GHz), while in the higher priced options it's a Q9000 Quad-Core, by Intel. 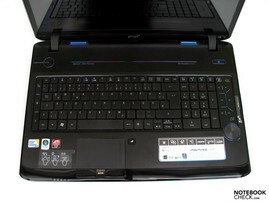 Now in our review: The Quad-Core CPU, 500GB Hdd and Blu-Ray (904G50BN) version for the price of about 1500 euro. In the Aspire 8935G you may admire the most recent evolutionary step of the once revolutionary Gem Stone Design. 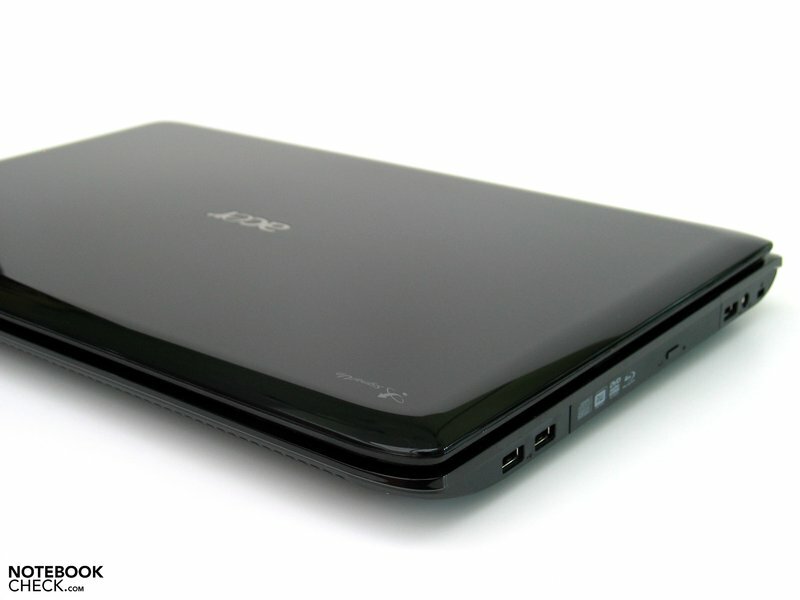 In comparison to the first Design-Tryouts (we remember the Acer Aspire 5920G), the developers and designers have become much more grown-up. Even though the laptop is still unmistakeably a consumer-multimedia device, we now see a design that's appealing but never too frisky. 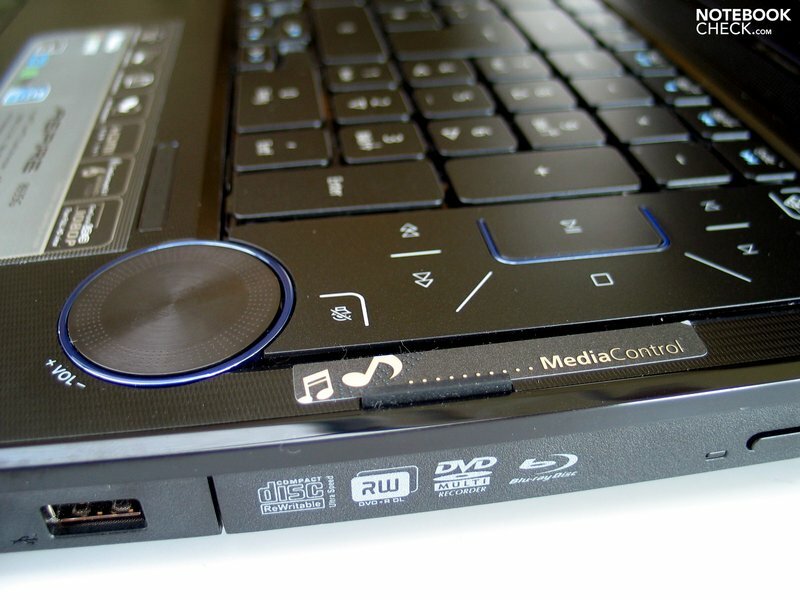 Discreetly placed single blue-illuminated elements can be found for example in the the areas of the On/Off button or the additional multimedia buttons. An eye-catcher is first of all the big volume adjustment wheel right beside the keyboard. It doesn't just look great, it's also very well to use, as usually just with Hi-Fi Devices. 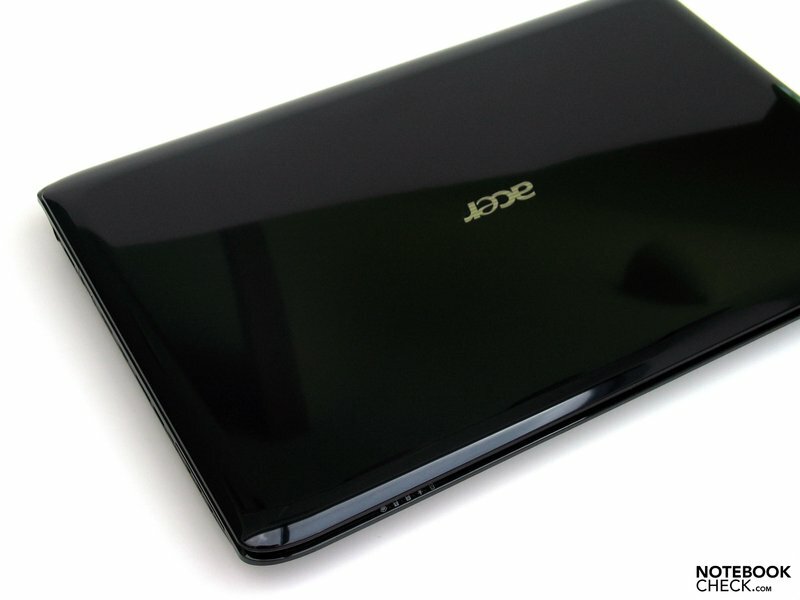 Even though synthetic materials are the first choice of Acer, the impression of the Acer 8935G's case is alright. What annoyed us in the process of our review was the high sensitivity for stains of the applied high-gloss parts. The base unit proved slightly prone to deformation under pressure, especially on the bottom part in the area of the optical drive. Also the display leaves a rather average impression regarding stability. Under pressure on the display lid or when bending forces are applied, you can quickly observe changes in the displayed image. All in all the case stability is acceptable for a DTR-Notebook that's used more stationary than on the go. The display hinges seem to be appropriately proportioned, still can't prevent the display from a slight luffing after adjusting the opening angle. There is no locking mechanism for the display in closed state. Regarding mobile usability: We remarked in our tests that the comparably small, but far enough apart pedestals of the notebook in principle allow operation on the lap - if the position of the pedestals is adjusted right to avoid painful pressure marks. On the software side of the test it should be mentioned that the countless pre-installed software can be extremely annoying when starting up the system. Google Desktop, Google Task bar in the Internet Explorer and a large number of Acer Tools slow down the start up significantly. 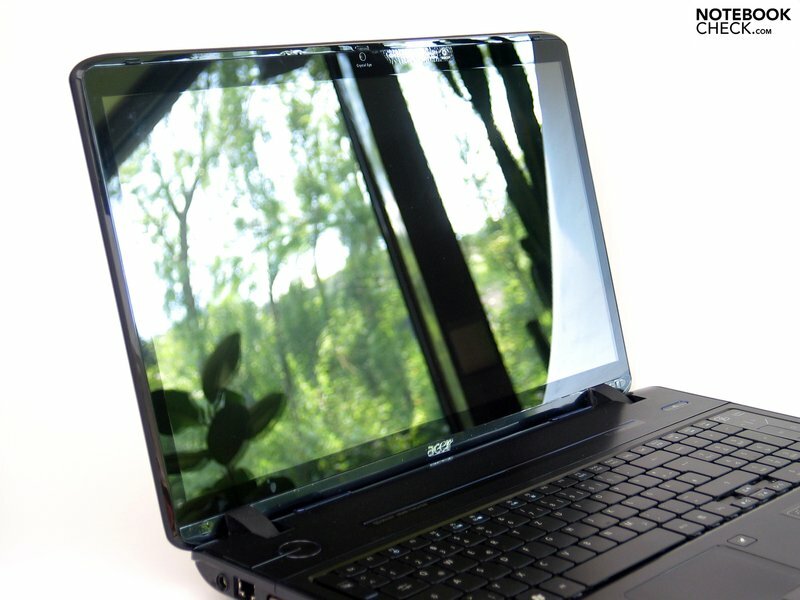 Performance-oriented users for this reason should clear the Acer Aspire 8935G before starting to work with it. 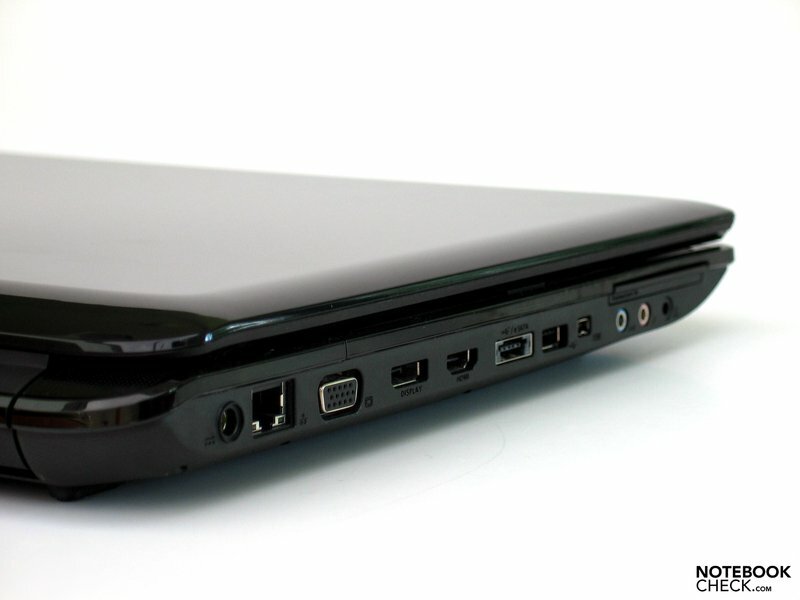 The ports can mostly be found on the left case side, spread over the whole lateral edge. What right handed people might find appealing, for left handed people, assuming an extensive use of the ports, can prove rather unpleasant. When working with an external mouse the collision with cables and connectors is almost unavoidable. 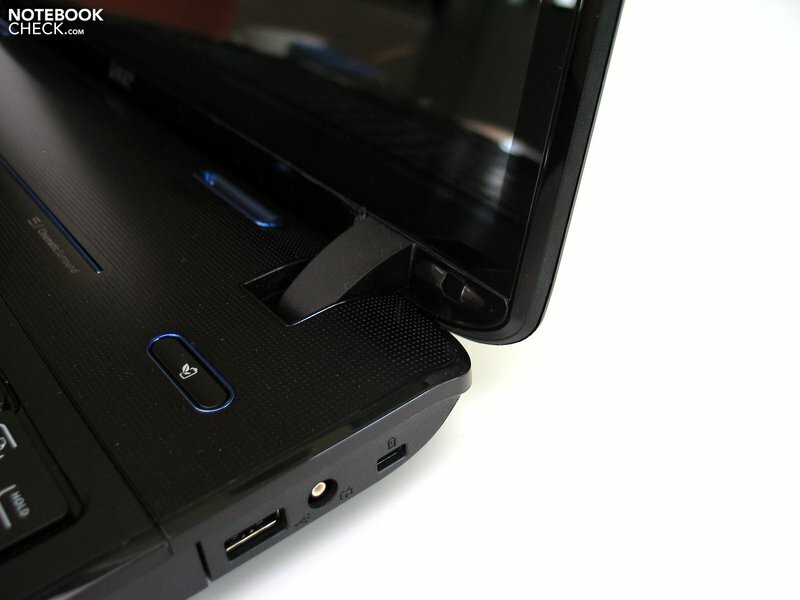 Right handed people only have to worry about the two USB-ports placed in the front area of the right lateral edge, which could alternatively be replaced by ports further back. The backside stays clear of ports and is used solemnly for the "Tuba", a sounding body that is meant to improve the sound quality of the speakers. Except for the card reader there are no ports on the front side either. The offer of ports is generally good. 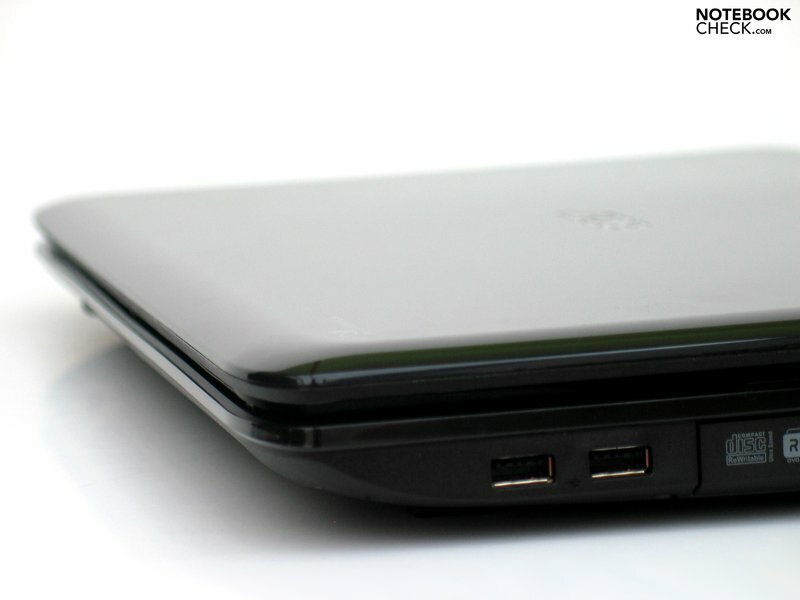 Beside the four USB-ports additionally there are a Firewire Port, eSATA, VGA, HDMI and display port as well as an antenna adapter for the integrated TV-Tuner in the Aspire 8935G. The 8935G has a kind of single key layout, but without the typical spaces in between the keys. 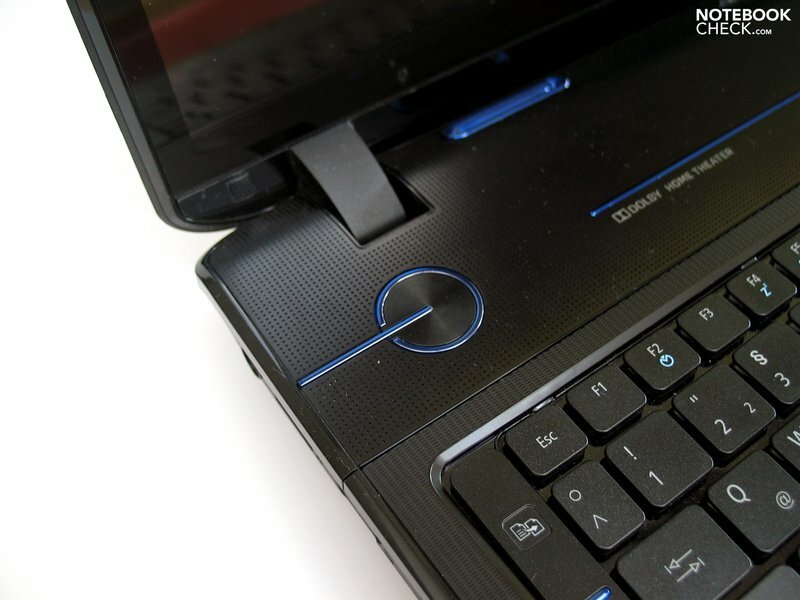 The keys themselves have been designed especially flat, which helps integrating the keyboard into the overall design of the laptop. The layout of the keyboard doesn't surprise, only regarding the size of the keys the keyboard has to accept some critique. In detail this refers to the left shift key, which has the size of a standard cypher key, as well as the arrow keys that have been shrunk to half the height of a normal key. Especially when gaming this can prove annoying over time. Visually the keyboard's back light is very pleasing, while it also excels regarding the type-feeling with a rather low key travel and a noticeable pressure point. Important for the type-feeling is also the flat key surface, whereas here the individual taste of the user is crucial. 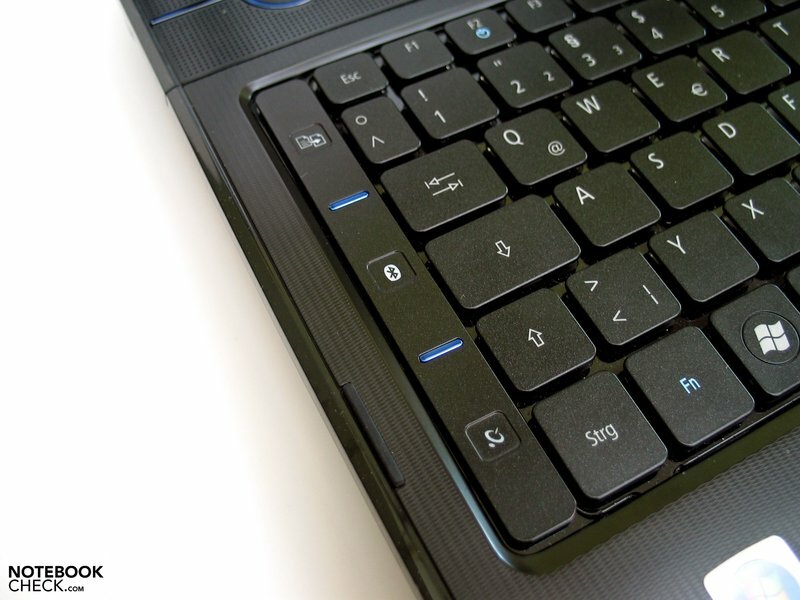 What we didn't like in the test was the spacebar that often made squeaking noises when being pressed. Because of the surface structure of the keys and their comparably sharp edges, the haptic markings of the F and J keys where hardly feelable, which resulted in a control glance when touch typing. 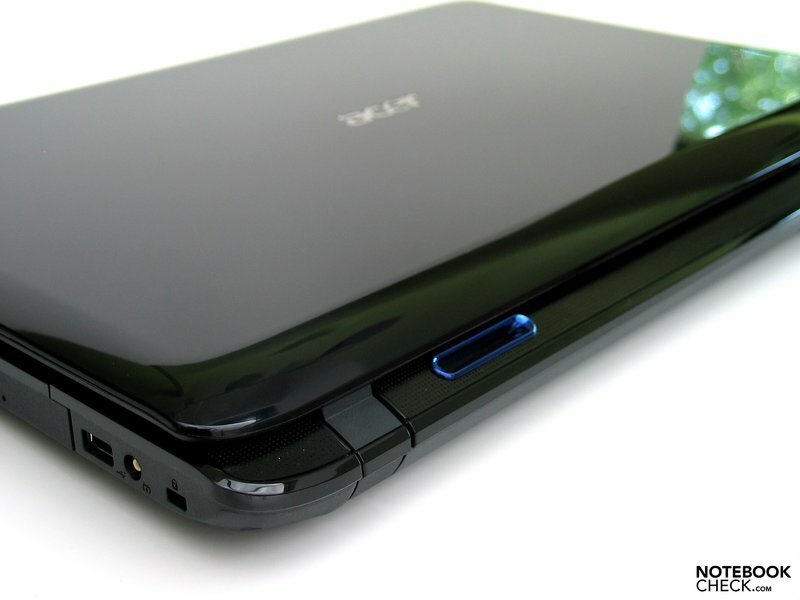 The touchpad is of a good size and has good gliding specifications. Though in the test it didn't always prove the desired precision. This applies also for the its buttons that we needed some time to get used to. The pad uses Acer's advertised gesture control, which means that the touchpad recognizes special movements on the pad as certain commands. For example the gesture of dragging a finger from the right corner of the touchpad to its middle in form of a spiral is interpreted as a scroll along an imagined horizontal. Though if you're already at the end of a web-site, this doesn't work. 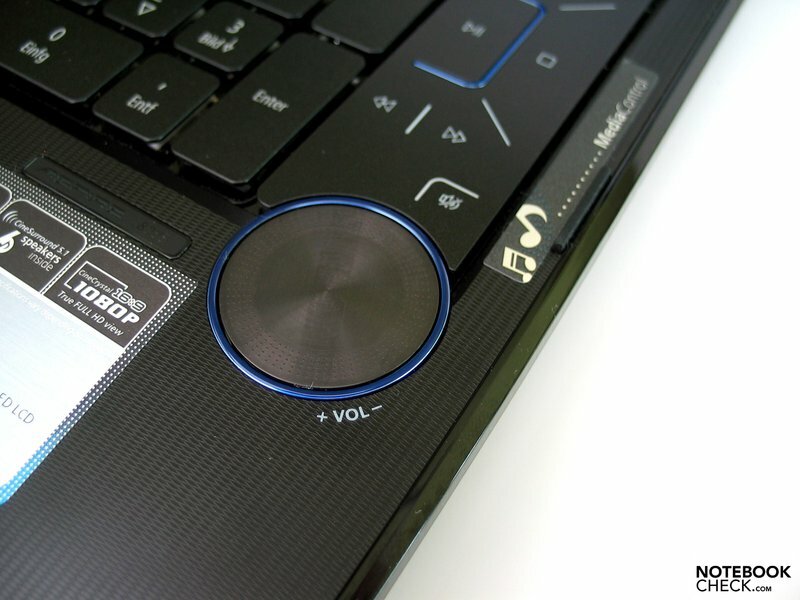 Luckily there's also a normal scrollbar integrated into the side of the touchpad. 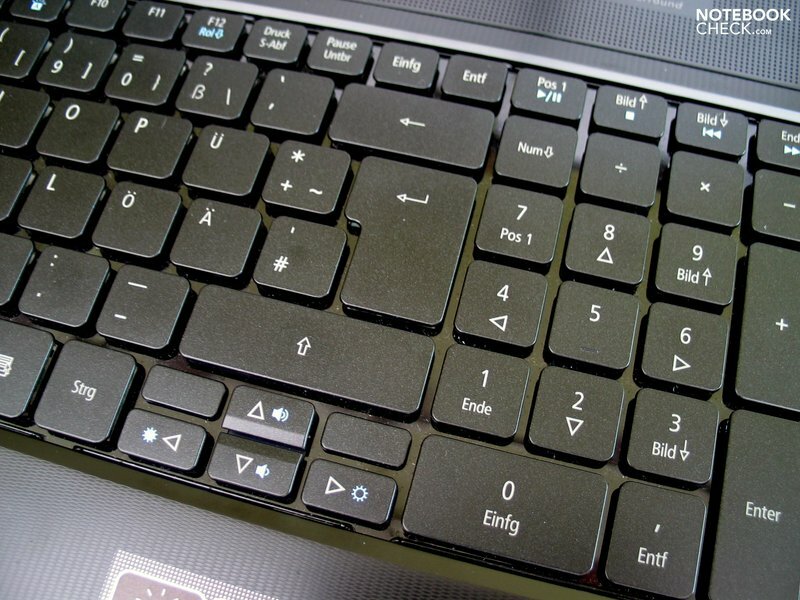 Furthermore, a number of sensor keys has been placed on the left and right side of the keyboard. However, especially the WLAN sensor key only works if pressed for a longer time, which was probably meant to avoid accidental pressing. The volume adjustment, as already said, is a highlight with exceptional haptic and good functioning. In all versions offered in the German speaking countries a full HD display is included. To fully profit of the 1920x1080 pixel resolution it's advisable to order the version with Blu-Ray drive, which will provide the necessary HD content. 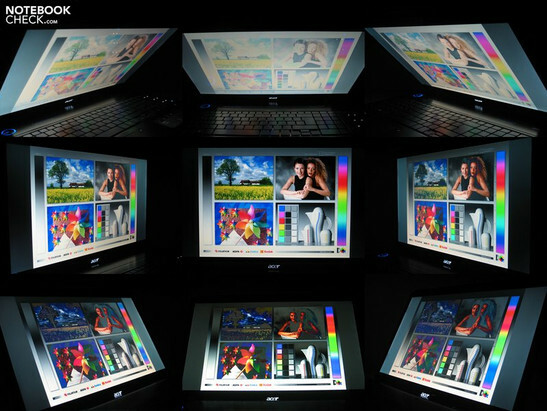 The measurements of the Display with a maximum brightness of 188.1 cd/m² proved average. In use the displayed image looks sufficiently bright, at least when inside. We also observed a decay of brightness in the lower corners of the display. In comparison to the maximum brightness the difference is acceptable, giving and also acceptable illumination of 80%. The colours subjectively looks alright, the panel shows vivid colours and also skin colours appear pleasing. The viewing angles in the horizontal area can be judged as good. Strong reflections upon decreasing the viewing angle cloud this impression. There are even annoying reflection when looking straight at the screen, especially upon displaying darker contents. Vertically, the image changes much faster. Nevertheless, the overall viewing angles are still satisfactory for a DTR notebook. 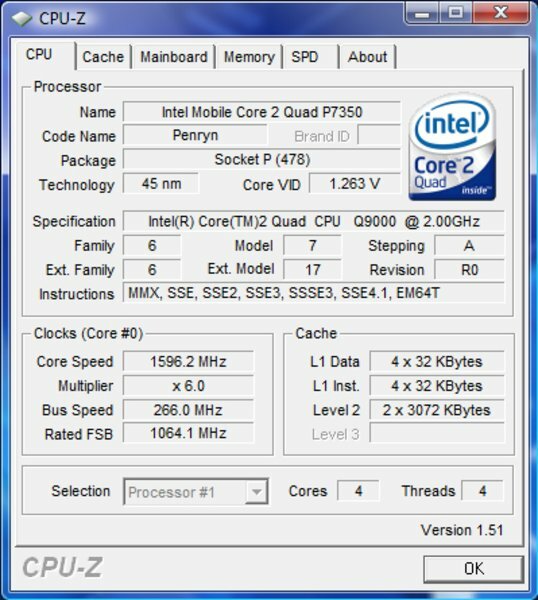 With the Q9000 CPU by Intel, a quad-core processor in Penryn architecture, our test sample uses the top version of the chips available. The strength of quad-core processors show not only when using multi-core optimized applications, but also when multitasking. Because there are four strong cores working at the same time, it is possible to run the same number of performance demanding applications without a loss of performance. 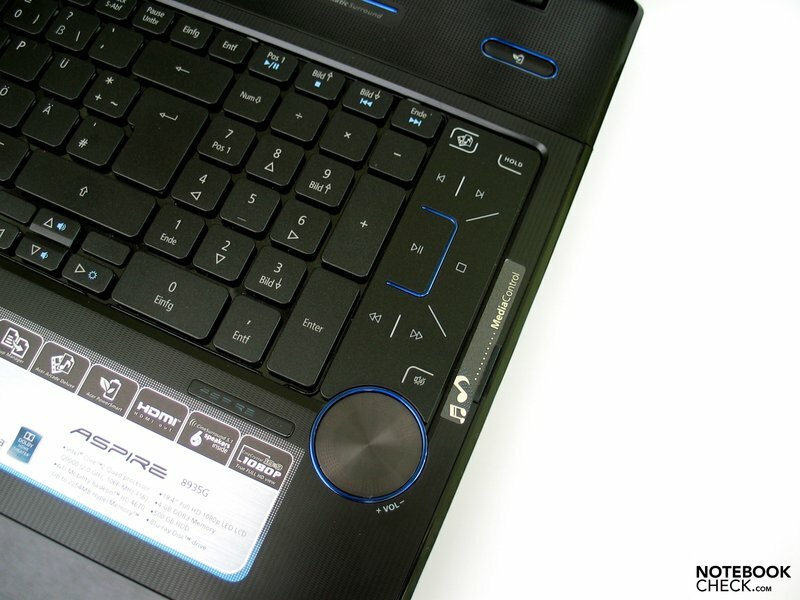 Especially when running multimedia applications the Aspire 8935G can play out it's strong card. Viewing HD content while using audio or image manipulation software plus a virus scan running in the background, doesn't pose a problem to this type of CPU. Also regarding graphics Acer has done some thinking. 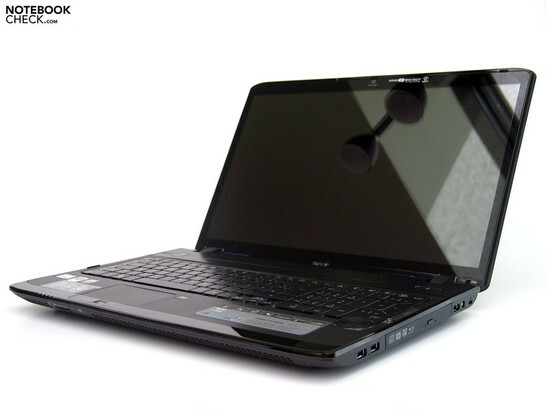 All versions of the laptop use a Radeon Mobility HD4670 by ATI. Having in mind the remarkably good performance of the already tested Radeon Mobility HD4650 our expectations on this graphic card were high. As a special feature the 8935G also supports an integrated chip set graphic solution. 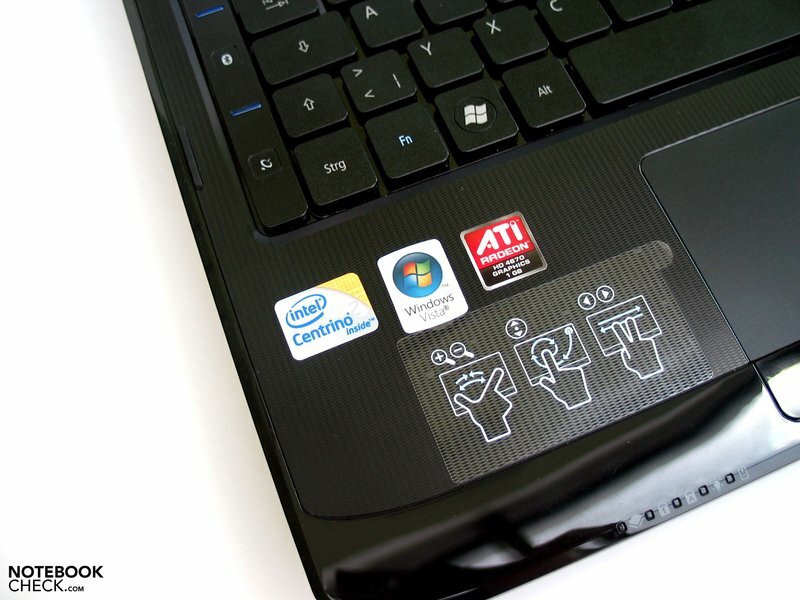 By means of the so called Acer Power Smart tool it is possible to switch between the HD4670 and the integrated Intel 4500M HD grafic chip set, either by a hot key on the base unit or through a symbol in the task bar. The operation takes about two to three seconds, during which the display loses its signal for moment and turns black. Furthermore, this only works as long as there's no 3D application running. How does that give an advantage to a multimedia / desktop replacement notebook? Well, the integrated chip set graphic needs significantly less energy than the independent graphic board, which leads to significantly lower heat emissions. Because in many every day life situations you are well off without high performance graphics, the switch option can be seen as a useful feature, more so because it's so fast and easy to use. 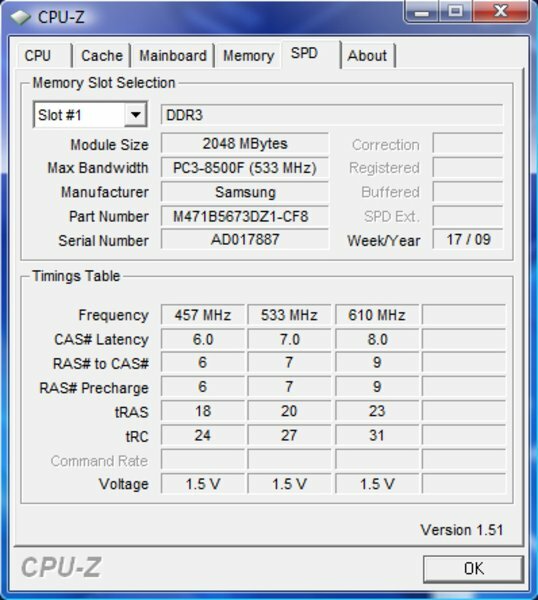 Taking a look at the 3D Mark 2006 benchmark for the 8935G how is it going to be rated? With just about 7000 points the 8935G places itself in the area of the mySN MG6 (HD 4650), although that uses the higher clocked T9800 CPU, and just behind the Toshiba X300 with Geforce 9700M GTS graphics and P8600 CPU. It is perceivable that the Q9000 CPU with only 2.0 GHz could have led to a little bit lower benchmarks than expected, for the reason that the HD4670 normally would be placed on the same level of the 9700M GTS. A totally different situation you'll find with the PC Mark 2005. 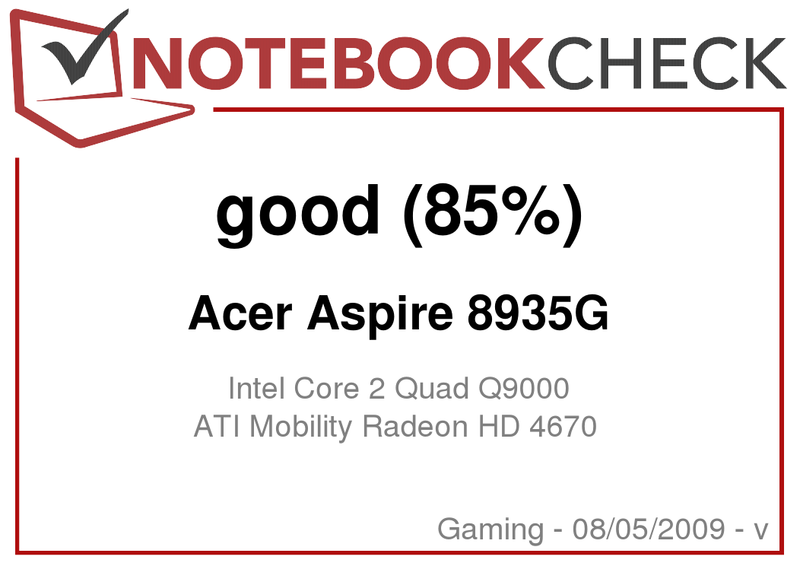 Here the Acer Aspire 8935G surprisingly reaches respectable 7125 points. The bundle of quad-core CPU, high performance graphic card and DDR3 RAM can score and for example leave behind the Toshiba X300. 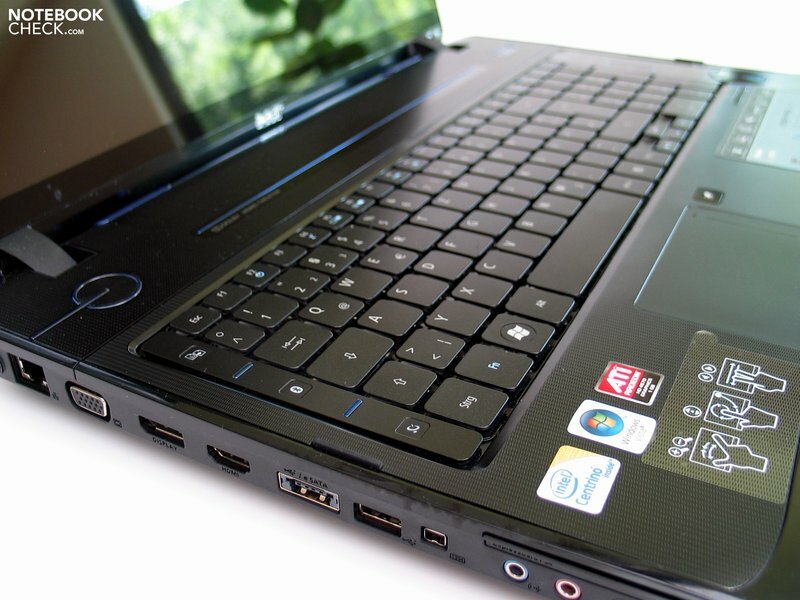 All available models come with a total of 4096 Megabyte type DDR3 RAM. Split onto two 2GB memory bars both available memory slots are occupied, however this keeps the price down, as the the current price of 4GB modules is still in cost-inefficient spheres. 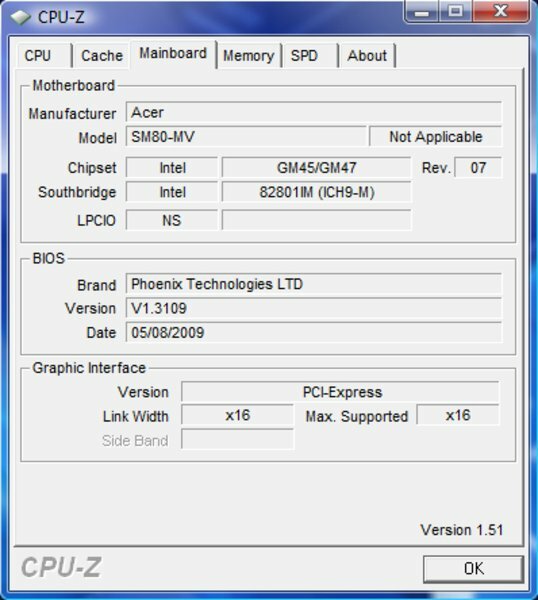 Despite the 4GB RAM Acer installs a 32-Bit OS in form of Windows Vista Home Premium on the Aspire 8935G on all versions available in central Europe. For the user this means that he effectively only has 3GB available when using Windows. When more memory is needed, the user would have to switch to a 64-Bit OS. Especially the used graphic board is probably of interest for many potential buyers of the 8935G, as it's technical data promises good gaming performance. As usual we check the hardware with a hands-on gaming test on the basis of a couple of recent games. The performance with the zombie shooter Left 4 Dead was convincing. With consistently appealing graphics, meaning a resolution of 1024x768 pixels and the details set to very high, the 8935G had a frame rate of about 91 frames per second (fps). Also the minimal observed frame rate stayed with just below 60 fps always in the fluid range. Left 4 Dead by the way was also playable with the GMA 4500MHD (minimal details, 640x480 - minimal of 11 Fps, average of 32.4 Fps), but only with a visibly worse display quality. With a resolution of 1280x1024 and high details, the most recent game from the Sims series delivers an average of 62 Fps. In general this is sufficient for a fluid game play, even though we also observed short collapses down to 10 Fps, which showed in form of short surges in the game. Because a 100% fluid performance is not quite the most important thing when playing The Sims, the game can easily be played with these settings. Apart from short performance collapses Fear 2 ran with a good average of 51.6 fps. Because the frame rate constantly stayed above 30 Fps, the game is spared of annoying surges. In comparison the mySN MG6 delivered slightly lower frame rates and, furthermore, showed significant collapses down to the no longer fluid game play area. The shooter Team Fortress 2 already has a big fan community and ran with an average of 65 fps in the native resolution of 1920x1080 pixels, on high details. Also subjectively the shooter is always fluidly playable. Only poor 19 fps were reached by the 8935G when testing the demo version of Anno 1404 (1280x1024, very high) This is generally alright to get through the game, although a little bit more performance wouldn't hurt. Reducing the resolution to 1024x768 and setting the details to "low" brought an immediate improvement: 77 fps. With the settings "medium or high" one should be able to finally find the right balance between performance and graphic quality. 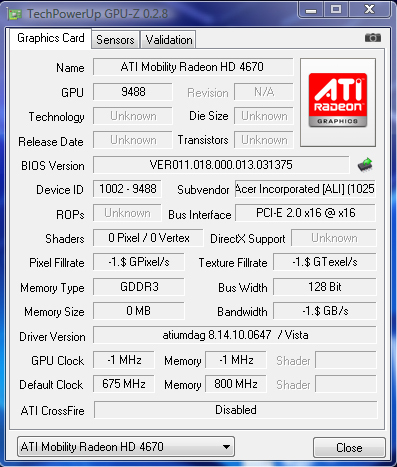 Generally the ATI Mobility Radeon HD 4670 graphic card delivers a well usable performance, and like the HD4650 is already far above the middle-class, which was recently defined by the Geforce 9600M GT . Especially for gamers a faster clocked CPU would sure be an advantage, because recent games not yet fully support the multi-core CPUs, which means that a faster clocking is to be prefered over the number of cores, at least when deciding between dual- and quad-cores. 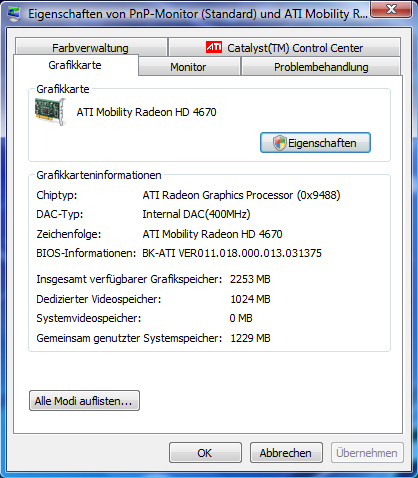 Also an interesting point is the memory equipment of the applied ATI Mobility Radeon HD 4670 graphic board. Acer on their homepage talks about „1024 MB dedicated DDR3 VRAM“. 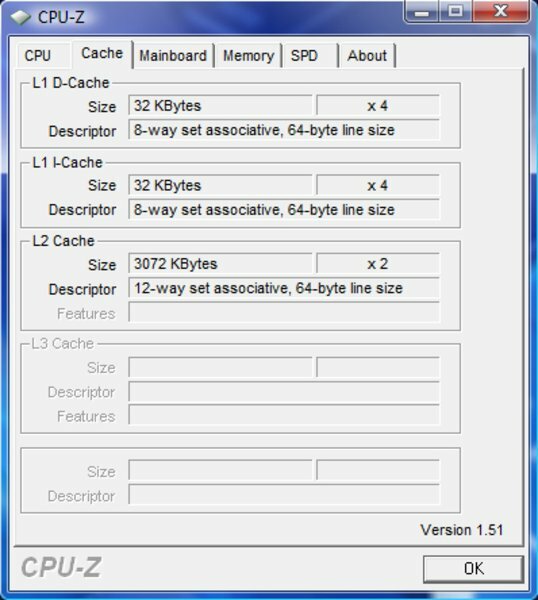 GPU-Z hints to GDDR3 video RAM, although this information is to be enjoyed carefully. 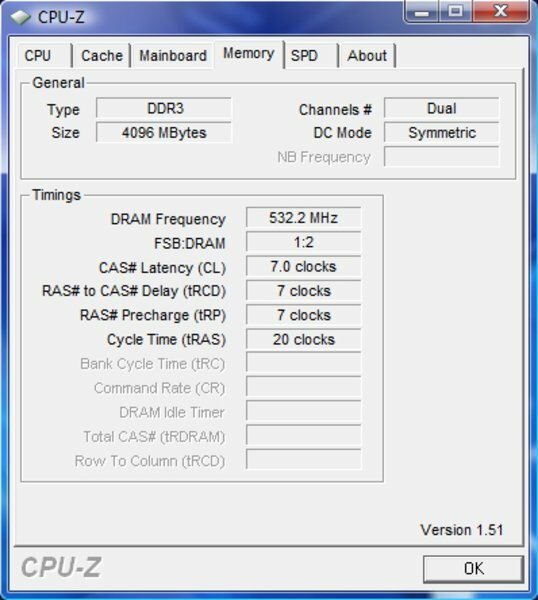 Generally the HD 4670 graphic board could be equiped either with GDDR3 video RAM (32-Bit) or the much cheaper DDR3 memory (16-Bit connection). 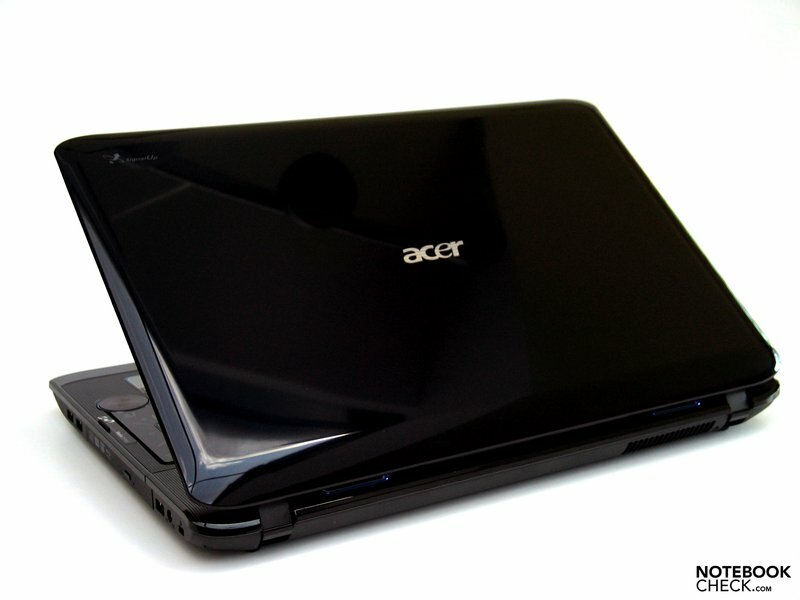 Regarding the 8935G we are still awaiting an official statement by Acer. The always running fan sobers the impression a little bit, especially because of the graphics switch option of the Aspire 8935G, which here doesn't bring any amelioration. The noise characteristic can be described as non-distracting, even though a noise level of 36.0 dB(A) when idle or in office use is definitely a little high. When full performance is needed, the 8935G reaches a constant noise level of 41.6 dB(A), even with full capacity utilization over a couple of hours. Subjectively this noise level, especially when gaming, is totally alright. 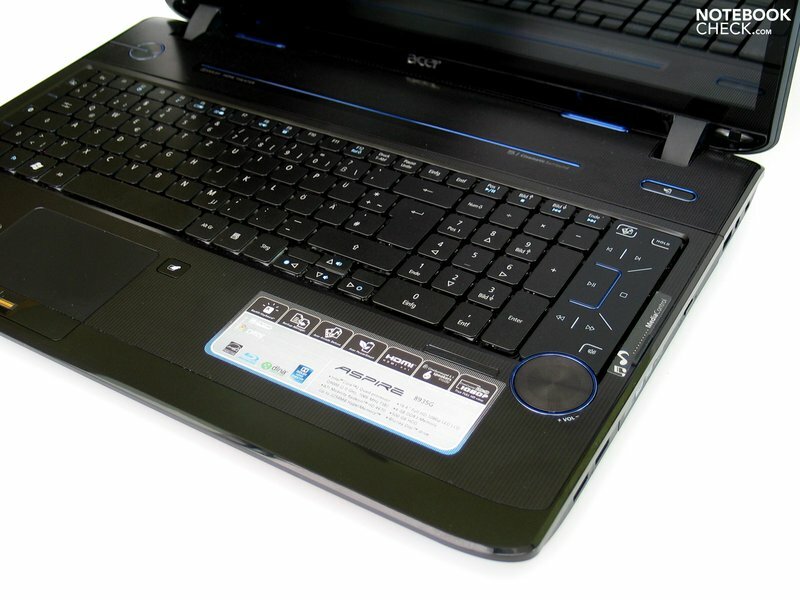 Furthermore, we remarked during the tests, that it seems when waking the laptop up from standby some Acer tool kept changing the individualized energy saving options. What really surprised us was the result of the measurement of the maximum surface temperatures. 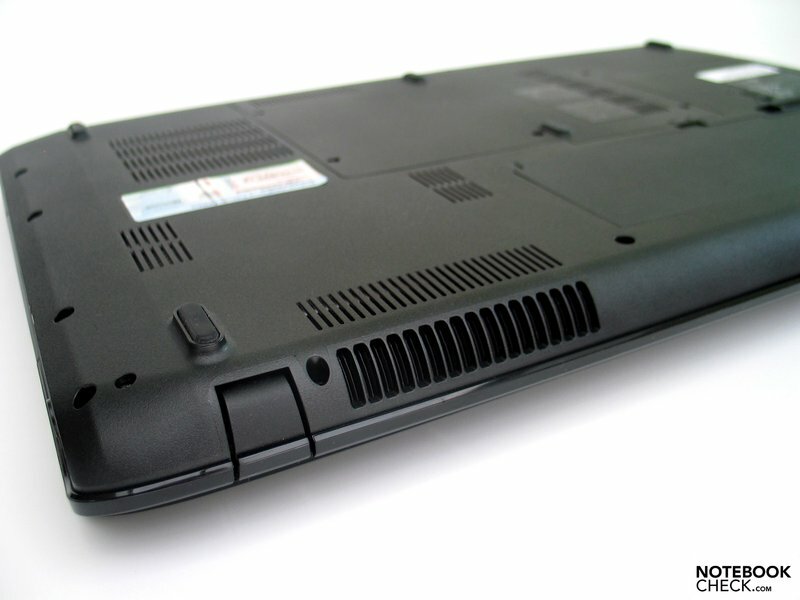 With temperatures up to 40°C in the area of the keyboard the notebook scraped the top of the tolerable range for the top of a base unit. The biggest surprise was when we measured the bottom side,which - with a maximum temperature of only 35.3°C - stayed significantly below that of the top side, and even below body temperature. Also subjectively the plastic case only got lukewarm. (±) The maximum temperature on the upper side is 41.8 °C / 107 F, compared to the average of 39.3 °C / 103 F, ranging from 21.6 to 68.8 °C for the class Gaming. Subjectively the whole sound spectrum comes out of the "Tuba" on the rear side of the case. High notes sound slightly reverberative and almost tinny. But, overall the sound is full. The maximum volume is rather moderate, but still alright. Especially for the playback of music it could sometimes be a little bit louder. Apart from that the sound system of the Aspire 8935G can be described as very present. However, it was not really noticeable that the sound system utilizes the six speakers with 5.1 surround sound. Equipped with a lithium ion battery with a capacity of 68Wh and the optional integrated graphic solution the Aspire 8935G fuels the hopes for a good battery life. With the Power Smart option (GMA 4500M HD) activated it achieved very good 310 minutes in the BatteryEater Readers test (minimal brightness, WLAN and BT deactivated). Under full load (HD4670, WLAN, and BT activated, maximum display brightness, profile "high performance") the battery life went down to only just about an hour (54 minutes). For the practical use the runtime while browsing the internet via WLAN is interesting. With maximum display brightness, energy saving mode and activated HD4670 graphics the 8935G achieved a battery life of 160 minutes. After switching to the integrated GMA 4500M HD it slightly increased up to 220 minutes. All in all these results are very alright for a Multimedia/DTR-Notebok. While watching DVDs the battery was empty after about 135 minutes (maximum brigtness, energy profile "balanced"). A little bit worse is the Aspire 8935Gs performance when playing back a Blu-Ray disc. Here we measured 120 minutes, which would already be too less for most blockbusters. 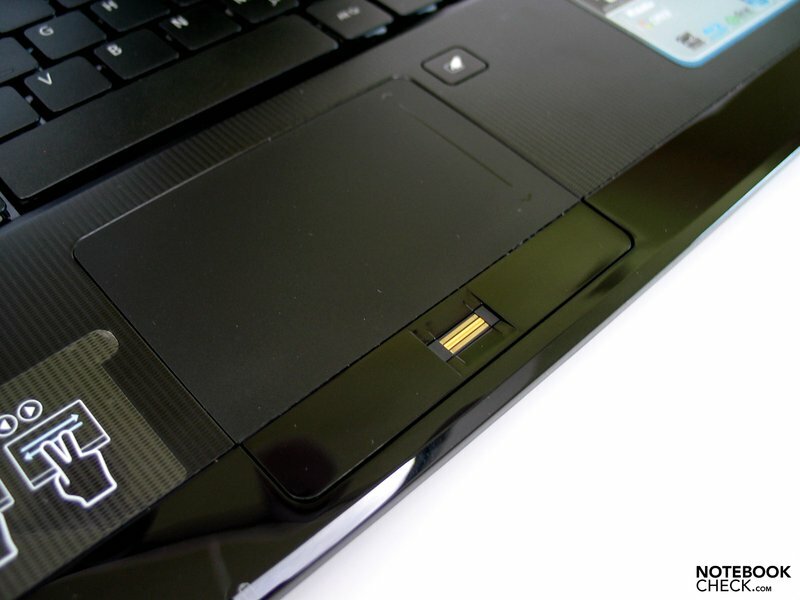 The notebooks power requirements with the dedicated graphics activated are a at least 28.5W. When using the Acer Power Smart option, it is decreased by about 30% down to 19.7W. The Power Smart Button switches to the integrated Intel GMA 4500MHD (GM45 chip set) and clocks down the 2.0 Ghz Quad Core Q9000 to 1.6 GHz. The energy saving profile of Vista throttles down the processor to 1.6 GHz too, which means that the lower demand for power mainly comes from the graphic solution. 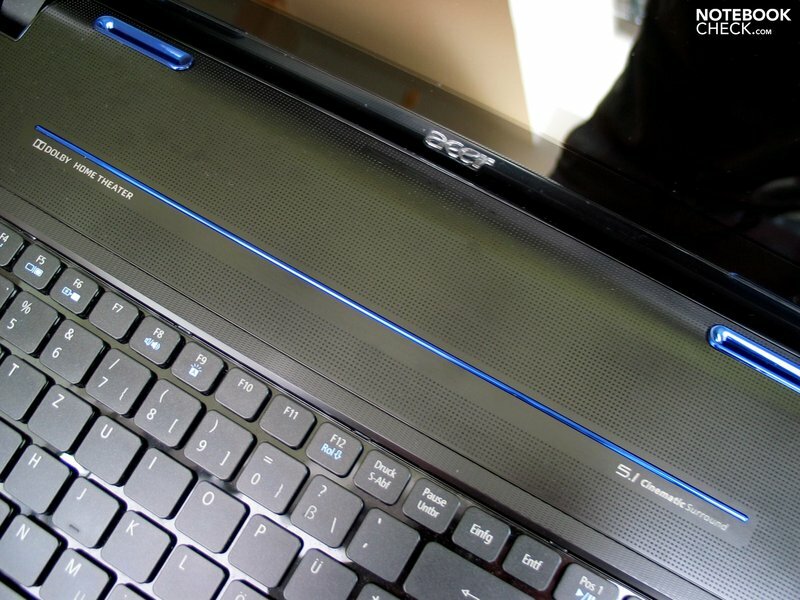 All in all the Acer Aspire 8935G leaves a thoroughly positive overall impression. 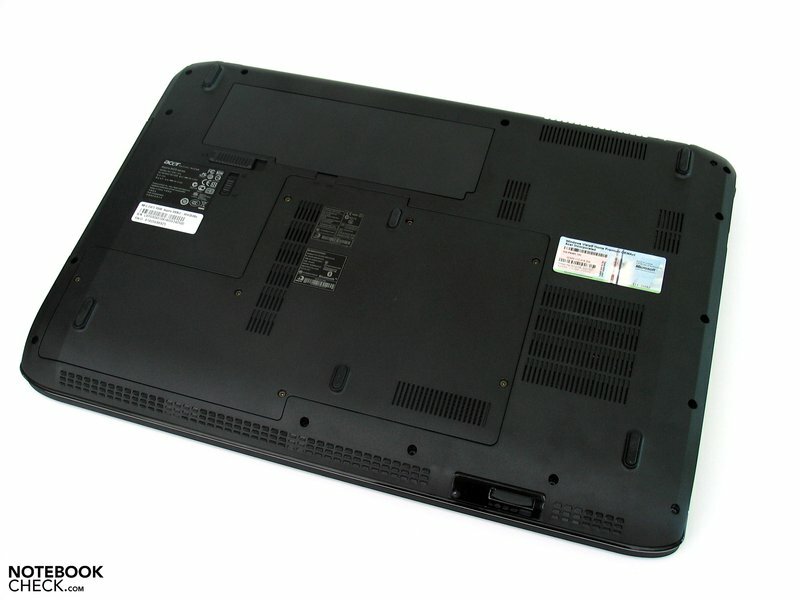 The 8935G is a big format multimedia notebook with an interesting price/performance ratio. The case can first of all convince with its design, even though the quality impression suffers from the materials used and slight deficits regarding stability. Also the port equipment is convincing, although the positioning of the ports is rather good for right handed people only. The display shows a attractive 1920x1080 pixel full HD resolution, and can be fired up with HD content by the integrated Blu-Ray disc drive. An integrated DVB-T Tuner as well as the consistently good sound complete the multi media equipment. Regarding performance the Acer Aspire 8935G convinces with very good results when using applications and also proves ready for competition in the 3D- and gaming tests. The 8935G allows complex office applications, like for example video- or sound manipulation, as well as playing recent games with attractive graphical details. Even though the noise emission isn't really disturbing in office use, the fan is always very present. Too bad, the potential of the graphic switch option (GMA 4500 HD / ATI Mobility Radeon HD4670) hasn't fully been made use of. The always remarkably cool case would surely have had more reserves. Looking at the power demand the notebook scores with the "switchable graphics" option. 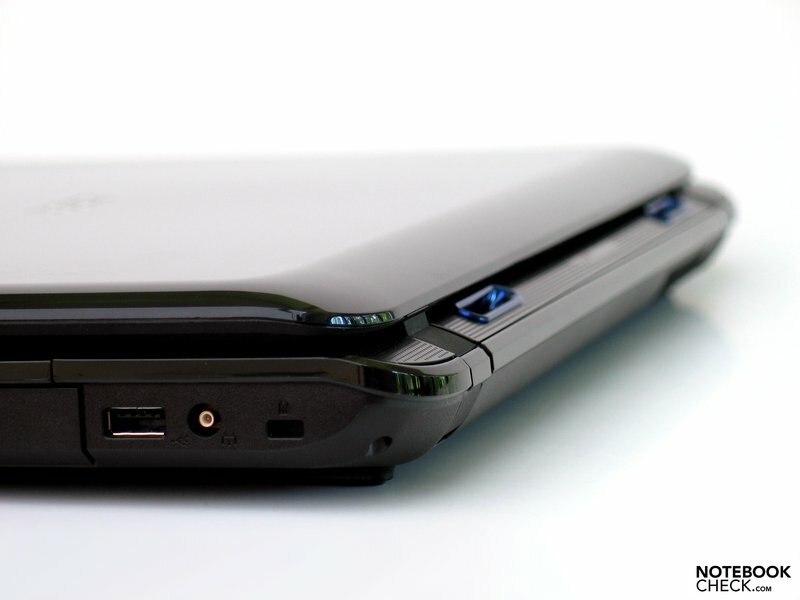 A battery life up to 5 hours is something comparable multimedia/DTR-Notebooks can only dream of. 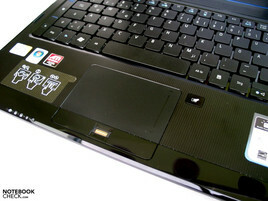 The touchpad is usually okay, even though sometimes it didn't react as desired. ...showed rather average results in the test. 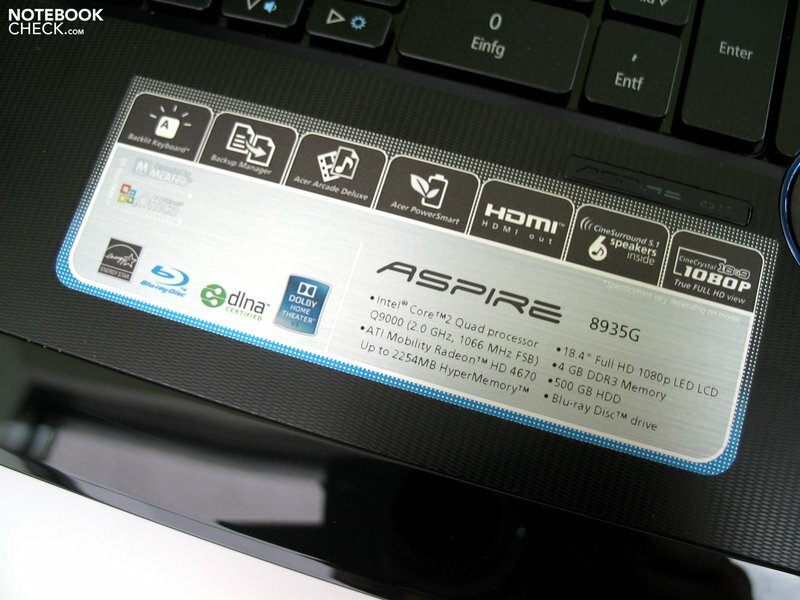 The Aspire 8935G scores regarding its equipment. ...as well as the high performance Mobility Radeon HD4670 graphics card by ATI. 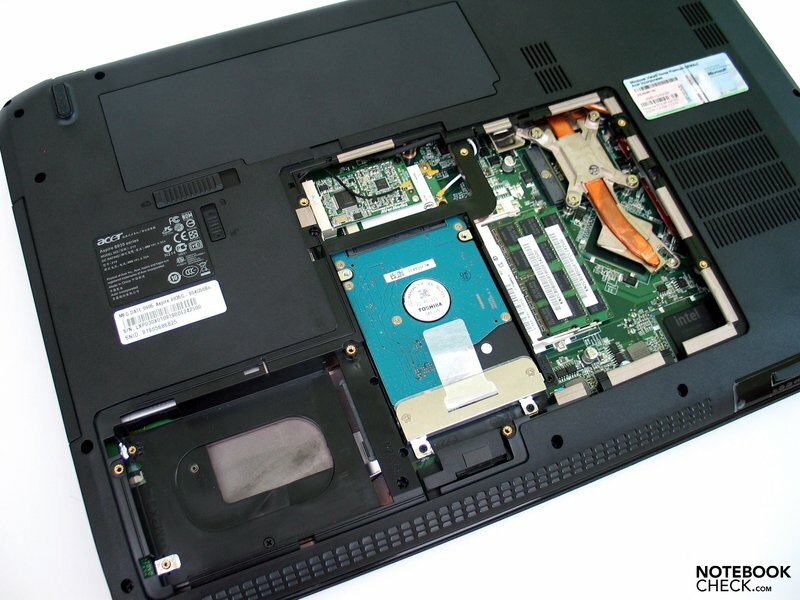 The components help the notebook to reach thoroughly good results in the benchmarks. 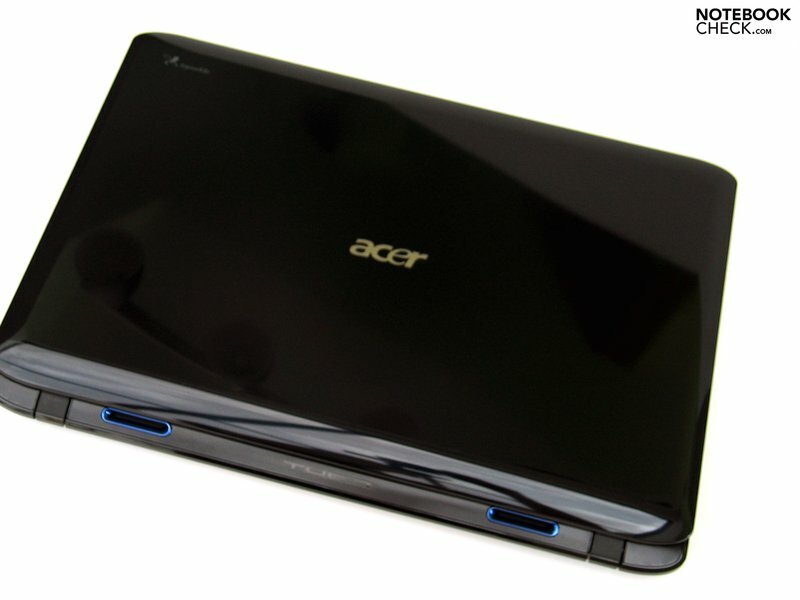 Acer also has the option to use two hard disks, the top version of the notebook already comes with one TB of memory. Unfortunately the fan is always present, which is disappointing regarding the integrated graphics solution. The surface temperatures are remarkably low. ...and profits from the sonority of the "Tuba"
On the left side there are additional buttons for the communication modules, which react very delayed. An optical as well as haptical high light is the volume adjustment wheel. ...of the Gemstone design that has been adapted again and again over time. Only regarding case stability there is some criticism. ...that are concentrated on the left side of the case. 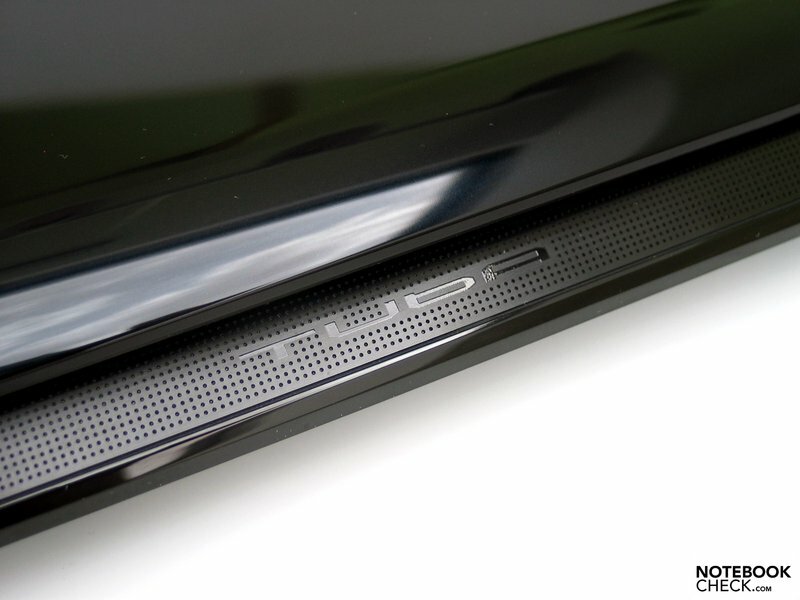 The Notebook is equipped with an integrated DVB-T Tuner. The keyboard presents a standard layout and is attractively backlit. Some keys unfortunately have been designed comparably small, like for example the arrow keys. ...which can be used to directly access several functions. When the chip set graphics is activated a respectable battery life of up to 5 hours is possible. Not bad at all! The extensive equipment of the Apire8935G. High performance core components, TV-Tuner, Blu-Ray and a FullHD Display reasonably priced. A strong two-core alternative to the Q9000 Quad Core CPU. Especially for gamers a faster clocking would be more useful than the four cores of the Q9000 CPU. For applications this is certainly a good choice. Cheap, big format multimedia notebooks. 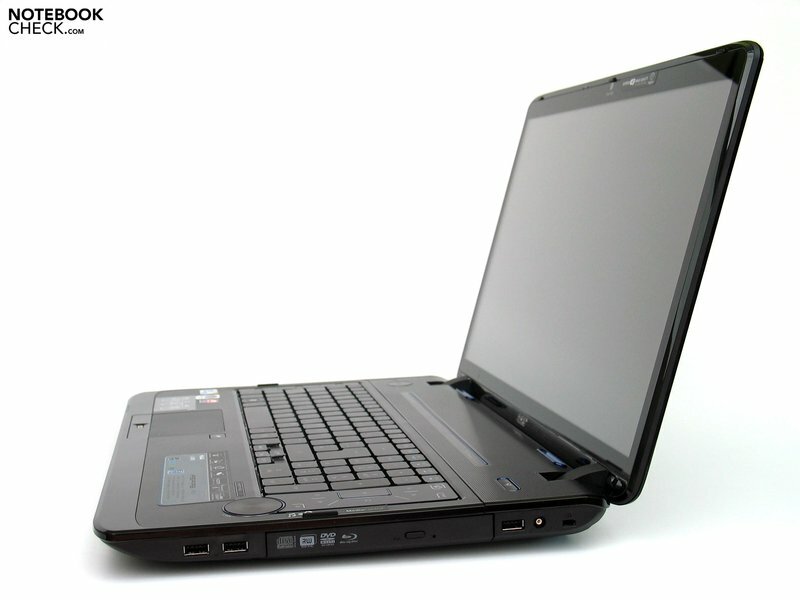 The high performance candidates would be found with the MSI (GT 725). 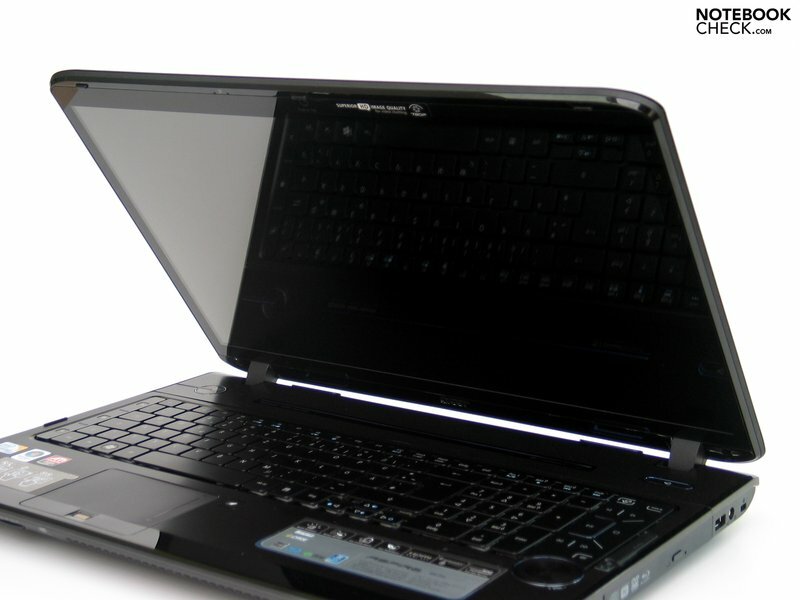 Also several models from Asus or Toshiba (Satellite P300 series, with the 17" screen). The Qosmio multimedia specialists (Qosmio G50) would be the closest bet, but with significantly weaker 9600M GT graphics. The equivalent models with the 9700M GTS are very rare.